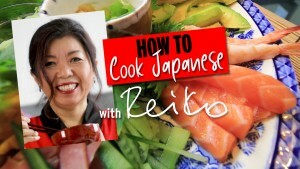 This is a link to the first three episodes of my new You Tube channel HOW TO COOK JAPANESE with REIKO. I hope it is something you will enjoy and maybe contribute to as my aim is to get more people cooking Japanese food each week and enjoying the health benefits we all share. I am very keen to hear any feedback. If you like it please let me know and if there is more I need to do, I’d like to know also. If I need to make changes that is relatively easy as my husband Bruce is doing the filming at our home. If you have any contacts with Japanese food, chefs or just great cooks I’d also like to hear from you, as we intend to include lots of great people as we spread the word that Japanese food is not only healthy it can also be great fun. I will upload new recipes every Saturday morning (I hope!) and this week it’s my favourite “party speciality”… Reiko’s Japanese Curry which lots of you have already tasted at our party! If you like the idea I hope you can subscribe to the channel as lots of subscribers can keep us going.